A graduate of Cornell University, Victoria Amador is the current president and CEO of Boston’s Best Commercial Cleaners and Tremendous Maid Services, located in Boston’s diverse Jamaica Plain neighborhood. Prior to her current role, Victoria was the Executive Assistant Housekeeper at the Breakers Hotel and Resort in Palm Beach, Florida. Throughout her tenure with the Breakers, Victoria managed as many as 200 employees, and was a key ingredient in the Hotel’s pursuit of AAA’s 5-Diamond acclaim. For those unfamiliar with AAA’s highly critical Diamond rating system, it is one of the most widely established evaluation systems for hotels and restaurants in the world. So critical, in fact, that of the hundreds of thousands of hotels and restaurants that compete for a 5-Diamond rating each year, fewer than 1% are actually granted 5-Diamond status. Other well known establishments awarded all 5-Diamonds include The Bellagio in Las Vegas, Boston’s Ritz Carlton, and Chicago’s Waldorf Astoria. Today Victoria has capitalized upon, and conveniently repurposed her skills for the commercial and residential cleaning markets. Inspired by her past, Amador has effectively adopted the proven cleaning methods and techniques used in the maintenance of the Breakers, and employed them in the service of her janitorial clients. As a result, Boston’s Best is one of the few, if not the only, commercial janitorial companies that can truly offer its clients a 5-Diamond quality clean. Today’s service market is governed in part by a host of highly respected organizations responsible for providing standards and criteria for a variety of different industries and businesses. Few of these, however, compare to the rigor associated with the 5 Diamond ranking system administered by the American Automobile Association (AAA). Providing ratings for hotels and restaurants, based on a rich selection of criteria, the 5 Diamond-system is among the most critical and widely referenced ranking systems in the world. So critical, in fact, that of the hundreds of thousands of hotels and restaurants that compete for a high ranking each year, fewer than 1% of the establishments are ever selected as 5 Diamond. So what does it take to create an establishment worthy of all 5 Diamonds? While there are many factors, there are a few with the ability to truly distinguish a hotel or restaurant from its peers. The most prominent distinguishing factor, however, is cleanliness. While only a handful of establishments earn a 5 Diamond rating each year, there are far more who are eligible. Many establishments possess the uniquely luxurious qualities and features necessary to compete, but the difference, as it turns out, is in the details. CEO and director of Boston’s Best Commercial Cleaning, Victoria Amador, knows better than most what it takes to distinguish oneself as an establishment, in order to achieve 5 Diamond status. Working in the upper levels of management at the critically acclaimed Breakers Hotel in Palm Beach, Florida for several years, Victoria was a key ingredient in the breakers pursuit of a 5 Diamond status. Why do you need this RFP Janitorial Services Sample eguide? Often Managers are so busy with day-to-day tasks, that the task of writing a RFP Janitorial Services can seem daunting and burdensome. But the reality is that if you do not take the time to create a solid RFP you will get very bad results —a bad hire and may be replacing the company again within months. This is the reason why we seriously recommend this eguide –its the perfect eguide for anyone looking to develop the right RFP Janitorial Services. Why do we care if you create the right RFP? Because We are committed to educating professionals about the cleaning industry whether you decide to work with us or another cleaning service provider –understanding why cleaning is vital to the health of your company and bottom line is important to us. If you are going to hire a marketing company to perform an advertising / marketing / sales campaign you do your best to understand what, why, how, when and who will be doing what within the marketing company to ensure you get your Return on Investment on the capital you invested into the campaign….so why not do the same and convey to yourself and your team that hiring the right janitorial service is very important for your company? Writing a RFP Janitorial Services can result in better business —trust us. There is research that clearly shows that a clean facility is an investment —if you want to read more on that subject visit this link. This RFP Janitorial Services sample is basically a best practices guide. 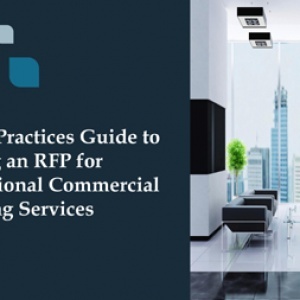 It will help you develop the best RFP you can to get organized, request quotes from the right vendors, evaluate the quotes and your annual cleaning and maintenance budget. This is an important document whether you plan to hire inside or outside cleaning help.